(Newser) – Not everyone can get home for the holidays, especially if they have to work, but Pierce Vaughan's father decided he would bring home to her while she was on the clock. 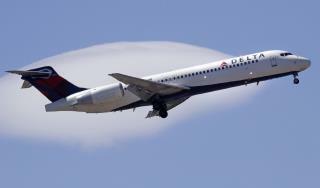 Per WXIA, the Delta flight attendant was on the schedule for both Christmas Eve and Christmas Day, meaning it would be the first Christmas she spent without her family as she catered to passengers in the air. But her dad, Hal, was determined that Vaughan have some company, so the Ohio man took advantage of a Delta rule that lets immediate family of flight attendants fly for free on standby, as long as there's an available seat, and hopped on the handful of flights that his daughter was working Monday and Tuesday. Mike Levy, a passenger on one of the flights from Fort Myers to Detroit, sat next to Hal and said the devoted dad told him he'd booked six flights in total, USA Today reports. So is the new meaning of the "mile high club"? Feel good story... 8 comments. Anything with Trump in the title.. 200+ in 20 minutes. This dad is a hero.